This will be a tour for all who enjoy listening to the sound of a steam locomotive, working hard to bring its train uphill. 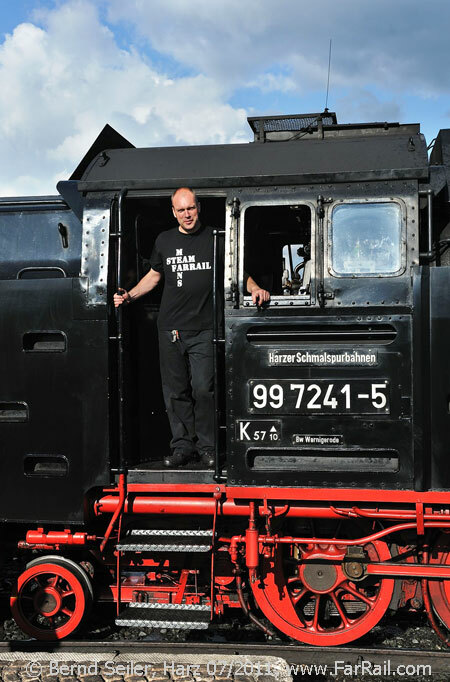 With a bottle of beer in your hand and your ear close to the smokebox we’ll cover all metre gauge lines of the Harz Mountains behind different classes of steam locomotives. We’ll not experience the cry of an early bird in the silent, dark forests of the Harz, instead we’ll feel the vibration of the hammer hard exhaust beat music from the chimney of our locomotives on the 3.3% grades. Therefore we’ll add the rail cabriolet of the railway directly behind the locomotive. To experience the unfiltered sound we’ll turn the locomotives and let them run bunker first, even on the Brocken line. No worries, it’s not as dirty as you may think: the unburned coal particles will be catapulted high into the sky, and when they fall back to the earth we’ll have passed the place already. We’ll add the rail cabriolet to regular trains of the Harz Mountain Railways, HSB, to make them even a bit heavier  which will make the sound of the locomotive even more impressive. 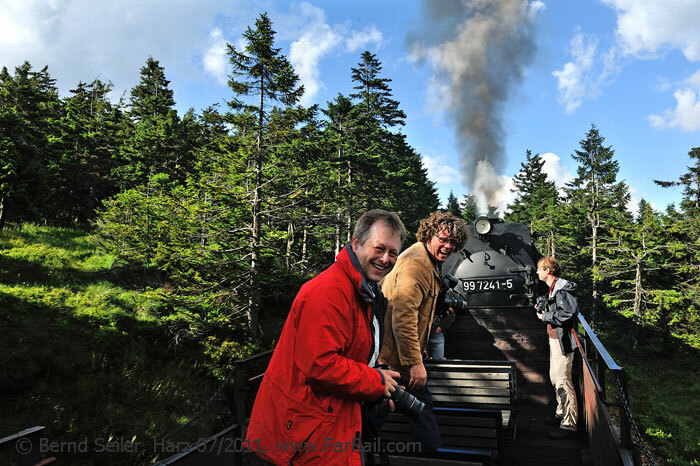 In 2012, we arranged a test run to the Brocken summit using this formation, locomotive tender first and our rail cabriolet behind the locomotive. After we thrashed through the tunnel everyone stood up and was flushed by the experience. 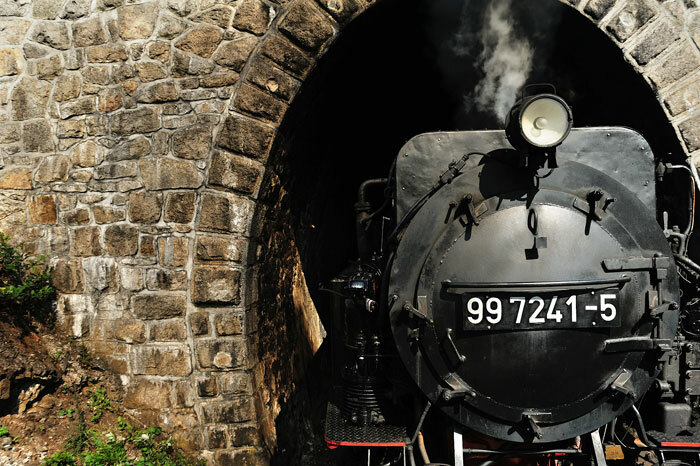 This tour will be for those who can enjoy steam even without a photo camera on hand. Behind a 2-10-2 class 99.723-724, or, if available, behind 99 7222 we’ll depart in our rail cabrio about 10am from Nordhausen to Eisfelder Talmühle. Here our wagon will be add to the Gernrode/Quedlinburg train which will probably be hauled by a Mallet, bunker first of course. On this line we’ll experience the sharpest gradients of the HSB system up to Birkenmoor and especially between Mägdesprung and Sternhaus-Ramberg. In Gernrode we’ll serve you a quick lunch (soup with sausage). You can either stay in Gernrode or go down with our wagon to Quedlinburg and back. In the afternoon we’ll return to Nordhausen with a detour via Hasselfelde. If everything works as planned, we’ll use the 2-6-2 no. 99 6001. The loco will face towards Gernrode so that we can, again, enjoy the direct exhaust orchestra. From Eisefelder Talmühle to Nordhausen we’ll roll downhill behind a class 99.723-724. We’ll return to Nordhausen about 18 hrs. If you want you can take some pictures in the depot of Nordhausen, where our loco will stay overnight. About 10 am we’ll leave Nordhausen again. 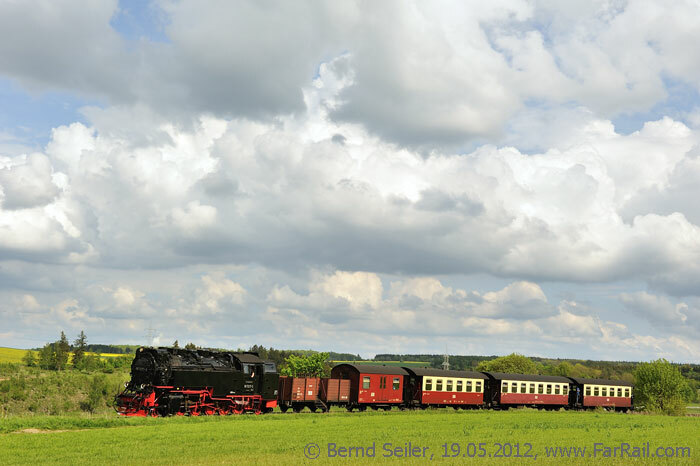 We hope that 99 7222 will haul our train bunker first from Nordhausen to Drei Annen Hohne. There we’ll change the train and after roughly half an hour we’ll roll down to Wernigerode. 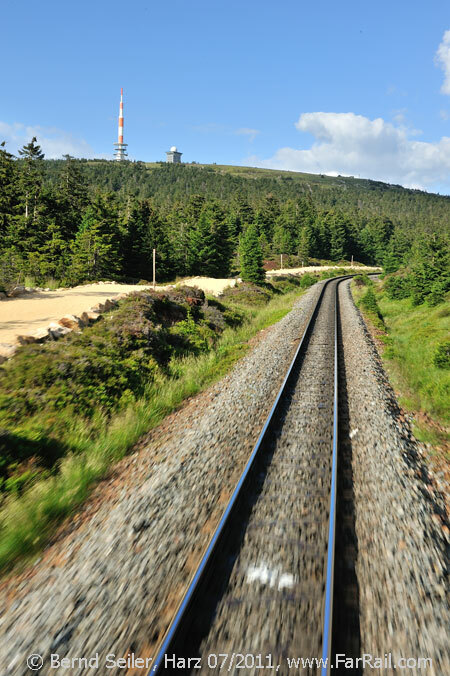 On this part of the journey we’ll be at the end of the train  because the last wagon will be the first on the way to the Brocken. In Wernigerode we’ve arranged a small warm lunch. Shortly before 15 hrs we’ll enjoy the final tour which is considered to be the ultimate experience on the system  the steep uphill run to the Brocken summit. Through the tunnel and the Brocken spiral we’ll reach the highest mountain of the Harz. About 19.30 hrs we’ll be back in Nordhausen were we’ll stay in the Hotel Altora, just 150 yards from the station across the street. Individual return trip. The tickets you need can be arranged by FarRail Tours if required. 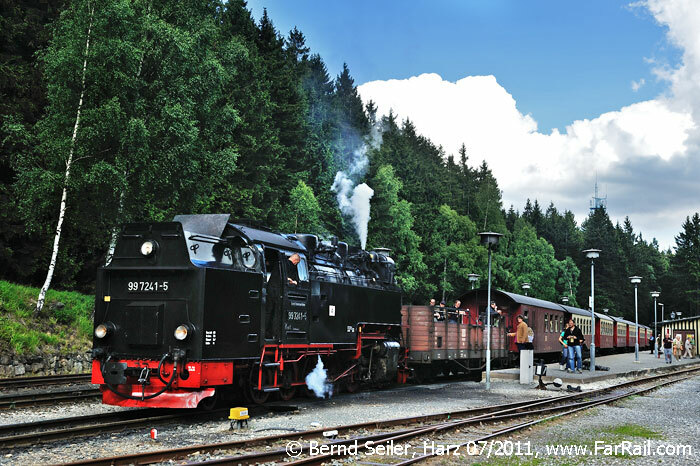 There is not much to add to all the articles and books about the Harz Mountain Railways. Virtually every yard of the railway was photographed many times, and thousands of pictures of the railways are around on the internet and in various books and magazines. The line leads through the mountains, passing forests and meadows, and rarely some fields. You’ll find some pictures of the railway in galleries and trip reports also here on this website. In case of rainy weather you can flee into the first coach and enjoy the ride through the Harz from there. As usual you’ll take part at your own risk, especially regarding damage to your ears or becoming dependent on the steam sound. Beer, wine or other alcoholic drinks should be only consumed in a quantity which allows you to realise that there is only one locomotive on the train. Once you see two locomotives you should stop drinking immediately. If you exceed this restriction you’ll need to walk the rest of the day because we want to have fun and not trouble. Our sound master in the orchestra pit. Although it’s summer when we ride the trains you should be prepared that, at least on MountBrocken, it can be very windy and cold. We’ll spend two days outside. So you may need sun protection as well as a jacket. Germany is a quite civilised country for travellers although ruled by its politicians who stick to a sick, artificial currency. However, you should never leave valuable belongings like your photo bag (if you bring one) in the cabriolet wagon when you wander around the station. Petty crime, such as theft or pickpocketing is no worse than in other European countries. Nevertheless, you would be well advised to keep a close eye on your photo equipment, as always. Our hotels can be considered as very secure. Entry into Germany requires a valid ID card for inhabitants of Schengen states, all others need a passport (but for many countries no visa is required). Electricity (220V, 50 Hz) is available in all our hotels, power cuts are almost unknown. You may need an adapter for the sockets. Mobile phone coverage is very good, Please take care as you will have to pay roaming costs for incoming phone calls as well as outgoing. Always use common sense when crossing roads and railway tracks. Neither the Harz Mountain Railways, HSB, nor FarRail Tours can be held responsible and will not accept any liability whatsoever in the case of any accident, damage or delay. We suggest you take out a comprehensive overseas accident and health insurance policy. A train ticket for all HSB trains, valid for our stay plus one more day. Please mention in your booking whether you prefer the 25th or the 28th as your third day. All trains are included.